What is the beverage tax? Legislators in Springfield are considering another new tax, this time on hundreds of everyday grocery items like lemonade, juice drinks, teas, sports drinks, soft drinks - even flavored water. A penny per ounce tax would increase the cost of a standard two-liter beverage by up to 68%! The proposed beverage tax will cost you $1.44 for every twelve-pack and $0.68 for every two-liter. More than five existing state and local taxes already add up to sticker shock for beverage consumers. 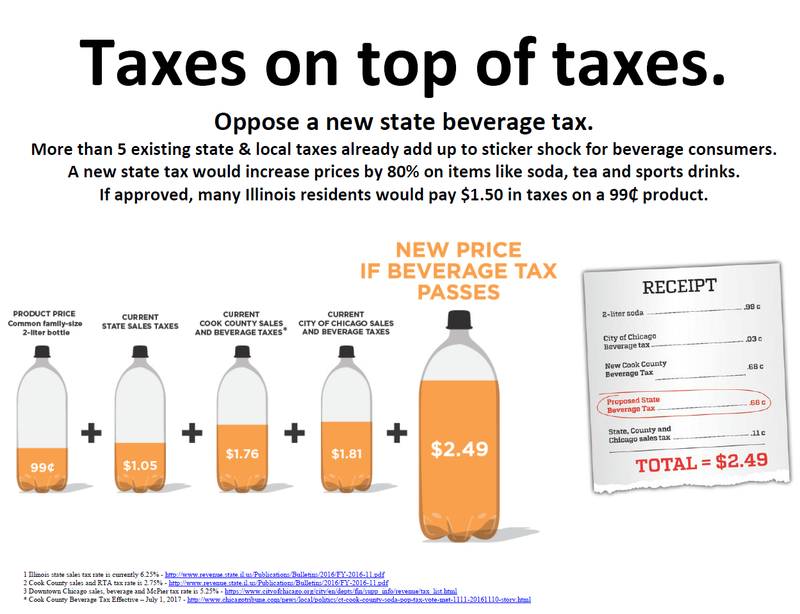 If approved, Illinois residents would pay as much as $1.50 in taxes on a 99¢ two-liter product. What products will be impacted by the beverage tax? Hundreds of products, like lemonade, juice drinks, teas, sports drinks, soft drinks - even flavored water, will be impacted. To see the full list, click here. How will this tax affect Illinois residents and businesses? This tax is regressive, disproportionately impacting the grocery budgets of those who can least afford it compared to wealthy households. Neighborhood grocery stores, restaurants, movie theaters and other local businesses that rely on beverage sales for a good part of their income will be hit especially hard. Local stores close to the state border are already having a difficult time competing with businesses outside of the state; this proposed tax will cost sales that can lead to job losses. Will a beverage tax make people healthy? No. This new tax is nothing more than a way to generate revenue. Obesity and diabetes are complex conditions that require real solutions. Taxes do not replace the benefits of a balanced diet, proper wellness education and physical activity. Placing even more financial burden on working families and small businesses does not make people healthier. What works is government and beverage companies working together as partners to increase consumer awareness about the importance of moderating calories and sugar from beverages. Educating consumers rather than taxing them is the meaningful way to improve public health without destroying jobs, hurting small business or increasing grocery bills on working families. Didn’t Cook County just pass a beverage tax? Cook County Commissioners passed a penny per ounce beverage tax at the end of 2016 that will be in effect in 2017. Cook County families and businesses already pay their fair share of taxes with the highest sales taxes in the nation. What can I do to help stop beverage taxes in Illinois? Make your voice heard today — send a letter to your legislators by filling out the form to the right. You can also call your legislators. Find their phone numbers by clicking here. Tell your elected officials to vote NO on the beverage tax. You can also join us in the important online conversation by engaging and following us on Twitter and Facebook. Yes, I want to join the Illinois Coalition Against Beverage Taxes and tell Springfield to stop piling on more taxes! PAID FOR BY THE AMERICAN BEVERAGE ASSOCIATION, A MEMBER OF ILLINOIS COALITION AGAINST BEVERAGE TAXES.